it was exactly one year ago, that I published my first article about Skycoin. At that time, Skycoin’s activity on Github was already high, but there were not a lot of content creators around, Synth had made only three interviews and overall social media presence of the Skyfleet was very little. Fast forward to one year later, Skycoin has evolved into a community full of builders, many people are actively tweeting about the project and thousands of miners are running as the backbone of the Skywire testnet. That growth can’t be taken for granted however. Over the course of 2018, we saw the Skycoin price plummet from its all time high of 53.85 USD down to 82 cents, some of the worst FUD attempts the crypto space has seen against Skycoin and even a kidnapping of Skycoin founder Synth. How many coins would have fallen apart after all of that happened? Just one of these incidents might have been enough to put critical damage to other crypto projects. But that didn’t apply to Skycoin. It is absolutely remarkable, that Skycoin did not only survive all of these incidents, but even grew stronger out of them. Even though Skycoin’s price is trading way below its average, we have seen so much progress throughout the project during last year. Skycoin has released the first generation of the Skyminer, launched a very successful testnet, hosted two major Skycoin conferences, released mobile and hardware wallets, finally got listed on a high-volume exchange, ramped up marketing efforts and released their scripting language CX. While all these accomplishments were achieved by Skycoin’s core team, we have seen tremendous growth throughout the community as well. Even though users had to assemble their miner manually, thousands of official miner nodes participated in the Skywire testnet. In addition to official miner nodes, we have seen a variety of amazing DIY miner builds by the community. The community growth was not only constrained to miners though. We saw the Skycoin community develop applications to support the ecosystem and build games with programming language CX. Interest in the currency Skycoin increased as well, with 10x more Skycoin transactions in 2018, than in its previous 3 years combined. Additionally, we have seen physical Skycoins coming to fruition, way more coverage about Skycoin in videos, articles or social media and even John McAfee becoming a true believer in the project. 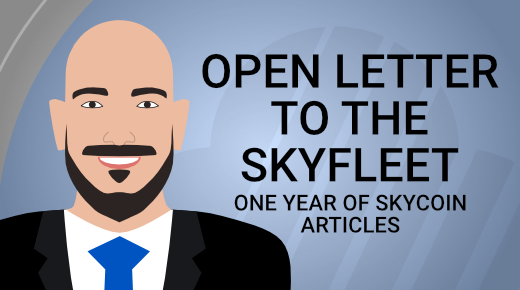 I started one year ago with the vision to create a one-stop shop of information about Skycoin and therefore published a ton of content throughout 2018 about the project. Besides comprehensive articles about Skycoin as a currency, blockchain platform Fiber, its parallel currency Coin Hours and the motivation behind a decentralized internet Skywire, I published a couple of unique articles, that reached a wider audience. My article about the Skycoin distribution increased transparency and made most of the FUD around the distribution go away. I introduced the Pine64 Skyminer as a completely new DIY miner build, that became the go-to model for many miners. I also published the first in-depth chain analysis on Skycoin, which showed the path of coins owned by early investors. I was always excited about Skycoin’s vision and I am still excited about it today. The way Skycoin has grown while interest in cryptocurrencies was very low during this bear market is truly remarkable and only a glimpse of the interest we would see, once successful applications are running on top of Skycoin’s infrastructure. So, Skyfleet, let’s continue to spread the word about Skycoin. Let’s implement the vision of a decentralized internet, that is fast, anonymous and censorship-resistant. And most important: Let’s continue to build a truly decentralized blockchain platform, that is ready for mass adoption.